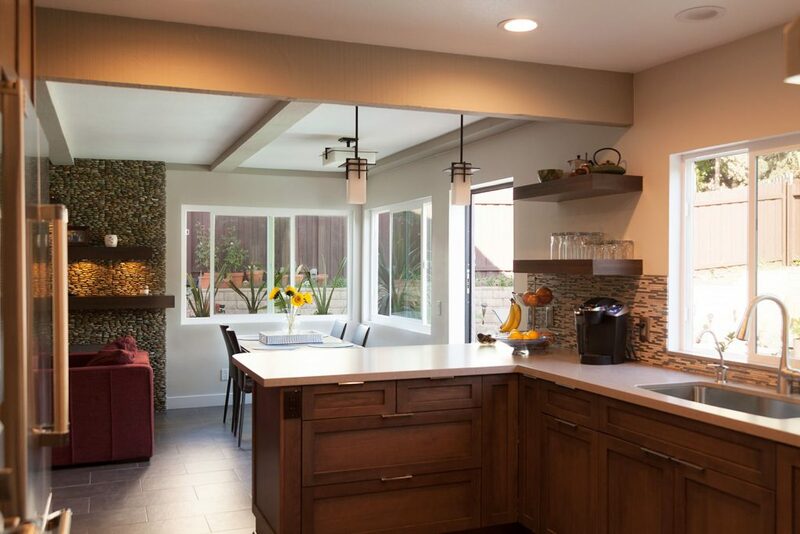 This Newbury Park family recognized that the original kitchen design in their home was limiting their ability to entertain, cook, and dine comfortably in this space. 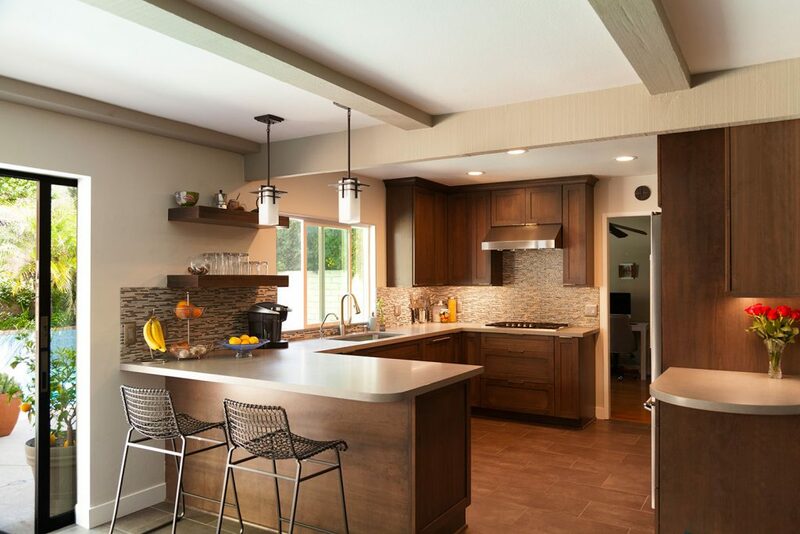 They came to Westside Remodeling wanting a more contemporary, striking, and space-enhancing kitchen design, one that allowed their daughter to bake while the couple cooked and prepared meals. 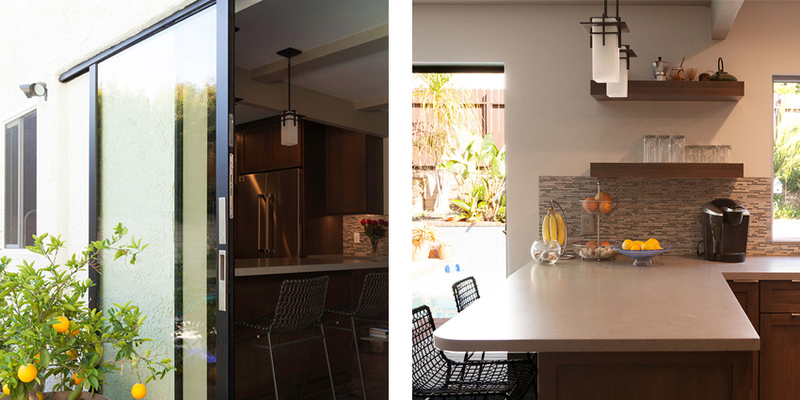 Alana Busse, our designer and remodeling specialist, used influences from Eichler to design a modern kitchen that incorporated dark-stained wood cabinetry, stainless steel appliances, and expansive quartz countertops throughout the room. The main constraint of the original design was the limited counter space. Expanding counter space in any kitchen remodel takes a bit of creativity, so Alana proposed that they add an open-pocket exterior sliding door to expand the wall between the door and the window. With this style, the sliding door is still visible in the wall from the backyard, but from the inside the door slides out of view. This is an exceptionally rare design, and there are only two other exterior open-pocket sliding doors in all of southern California. This wall expansion allowed us to include a larger peninsula between the kitchen and dining area, and the stove top was moved from the peninsula to the opposite wall, expanding and better utilizing the available counter space. The Bosch refrigerator and the Thermador oven are grouped along one wall to keep them accessible while other family members are cooking and preparing food at the countertops. This kitchen design incorporated modern influences with the shaker cabinet doors and stainless steel appliances. 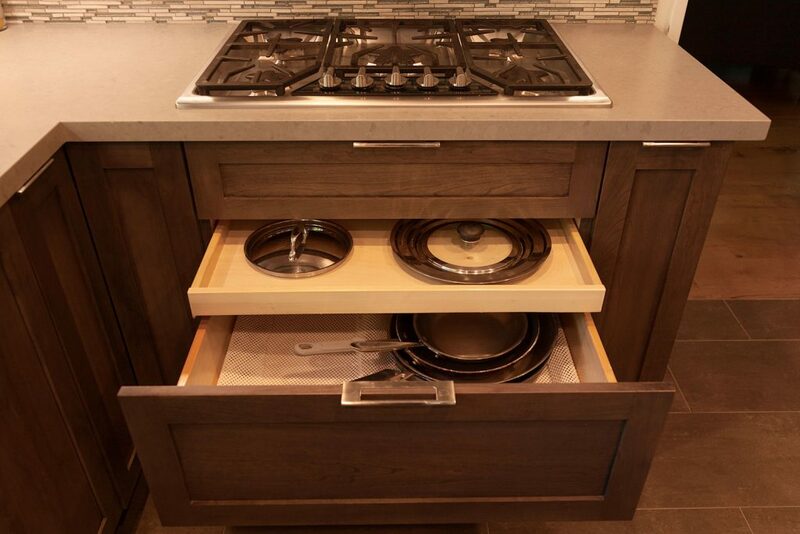 The dark wood cabinets are all fitted with sleek nickel handles, and much of the cabinetry takes advantage of multi-tiered storage to better take advantage of storage space. The dark cabinets contrast the lighter colors in the backsplash and the quartz countertops. Taking inspiration from her New Jersey roots, the homeowner chose to add glitter throughout the backsplash that adds a shimmer to the wall. The quartz countertops have a honed finish that offers a softer more natural look. The rectangular shapes of the floating wood shelving and the hanging light fixtures add to the modern design, and the open layout between the kitchen, the dining room, and the living room creates a very expansive feel in this space. In the dining and living room area, we also remodeled the bar and fire place. The bar remodel included a custom pegboard wine rack that was CNC’d locally by the team at Westside. This wine rack adds a modern but subtle touch to this bar area and it blends in with the dark stained shaker cabinets. 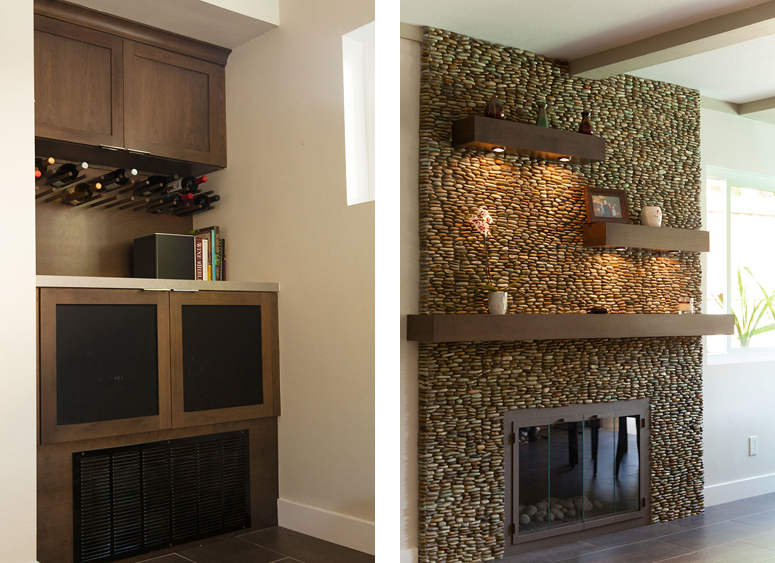 For the fireplace, the clients chose stacked riverbed stones to cover the chimney which was fitted with wood shelving with custom built-in lighting. The custom lighting adds an attention grabbing allure to this wall in the living room. The entire remodel rejuvenated this space and provided a lot more freedom for this family to cook, prepare food, and entertain with ease. 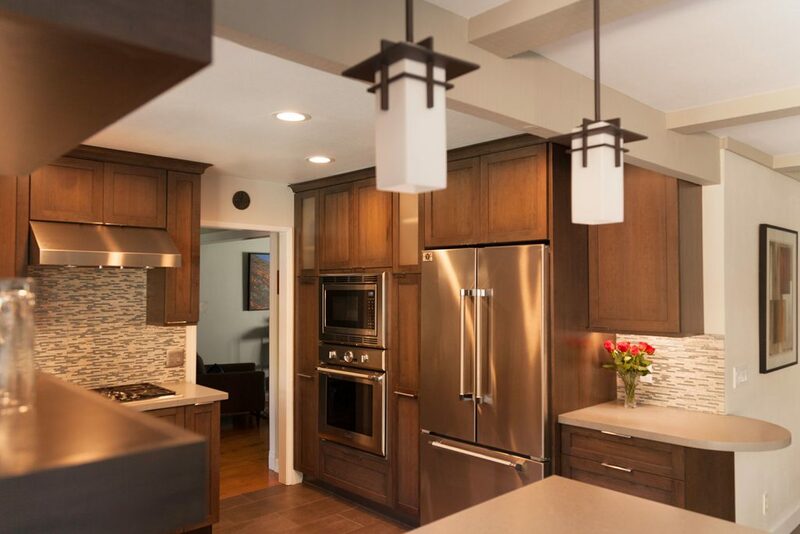 See the full gallery of this remodel and others in our kitchens project gallery. If you’re located near Thousand Oaks and you’re interested in talking about a kitchen remodel, contact us or come visit us at our showroom in Newbury Park. You can never have enough kitchen counter space. Like you said, sometimes you need to be creative but usually there are ways to add more counter space. Thank you for sharing post. Beautiful designs.